Tall cell variant of papillary thyroid cancer has been shown to be more aggressive and have a worse prognosis than the typical papillary thyroid cancer. See more info regarding papillary thyroid cancer and other thyroid cancers. tumor less than 5 cm. Postoperative Iodine 131 to diagnose / treat metastasis if a total thyroidectomy was done. Pentagastrin is used as a stimulation test to elevate serotonin levels and cause symptoms of carcinoid syndrome, provoking flushing. Pentagastrin has been used to stimulate ectopic gastric mucosa for the detection of Meckels diverticulum by nuclear medicine. Pentagastrin-stimulated calcitonin test is a diagnostic test for MTC (Medullary carcinoma of the thyroid). In patients with suspected MTC but borderline levels of calcitonin, injecting pentagastrin will cause calcitonin levels to rise tremendously. When thinking of neck zones, there are those zones used in trauma and there are those used for cancer surgery. In patients presenting with solid neck masses – those masses associated with the thyroid move with swallowing. Those in levels 3,4, and 5 do not move with swallowing. Metastatic lymph nodes found in level 6 – could come from thyroid. 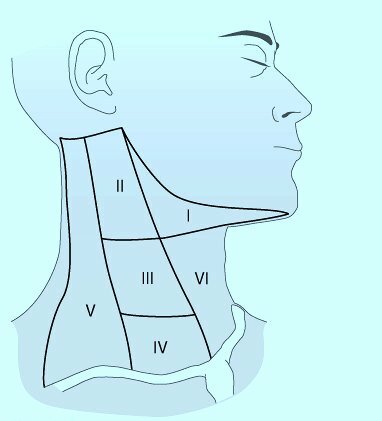 U/S and FNA should be performed after exam/history for Solid Neck Mass. With well differentiated thyroid cancers, there is a high rate of cervical metastasis particularly with papillary cancers. With lateral lymph nodes involved in thyroid cancer, survival rate is not improved significantly with LN dissection in the neck for patients older than 60 years old or for men with a 4 cm or larger well differentiated cancer. Prophylactic lymph node dissections does not seem to improve survival with patients undergoing thyroid cancer treatment. 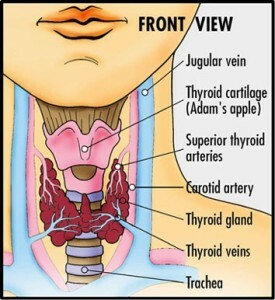 If thyroid tumor is small with documented (U/S) lateral lymph nodes. There is a benefit to dissecting level 3 or 4 lymph nodes (lymph node dissection or modified dissection) in the younger patient. Most common complication after total or near total thyroidectomy is hypocalcemia due to hypoparathyroidism. Post thyroidectomy hypoparathyroidism is usually related to disruption of the blood supply to parathyroid glands. A patient needs only a single healthy parathyroid gland to have normal parathyroid function. Parathyroid hormone measurement after surgery. Possibly consider this protocol. If less than 10 (pg/ML) supplement with calcium and calcitriol. If between 10-20 supplement with calcium. If greater than 20 – then no supplementation. PTH is secreted by the chief cells of the parathyroid gland. PTH half life is about 4 minutes. Hormonally active form of vitamin D.
After thyroidectomy, supplimentation with Calcitriol may supress PTH levels. To monitor for the risk of hypocalcemia.